All six figures merge to form Computron! Build the entire team! Grimlock's pet project is back as a big 'bot built for battle - and of course, advanced mathematics. Computron is made up of several great Autobot warriors, and the Technobots are finally back to square off against the Decepticon menace. Get the first-ever Scrounge, the all-purpose legend of Autobot lore, as a transforming flying saucer. 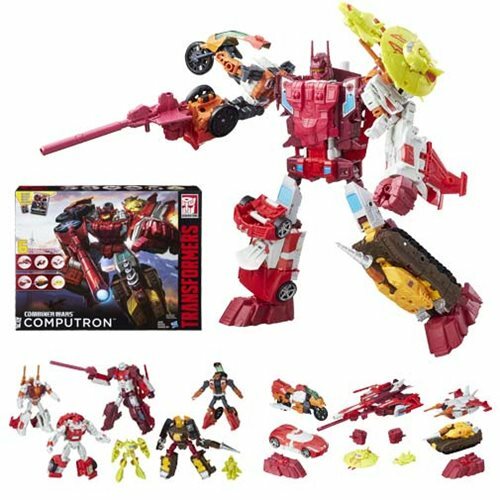 He's joined by Afterbreaker, Lightsteed, Scattershot, Strafe, and Nosecone who can merge to form the giant 12-inch tall super robot Computron. Smash the Decepticon menace! Probability of awesomeness: 100.00%! Each of the six robots is armed with unique accessories and weapons to make this team the best ever, plus it has unique giant robot hand and feet pieces to make Computron look even more fantastic. Ages 8 and up.